This video shows the second time that Newt was around mounted shooting. The first time was shown in the video “3 Steps for Introducing a Horse to Mounted Shooting.” If I had one tip for someone who wanted to get started in the sport it would be to find a local club or a local professional who you can ride with. You can also see from this video that both of us are wearing earplugs. The first thing I do with a new horse is to watch how they react to other people shooting. You can see in this video that Newt is surprised at the first shot but then quicky turns to interested. 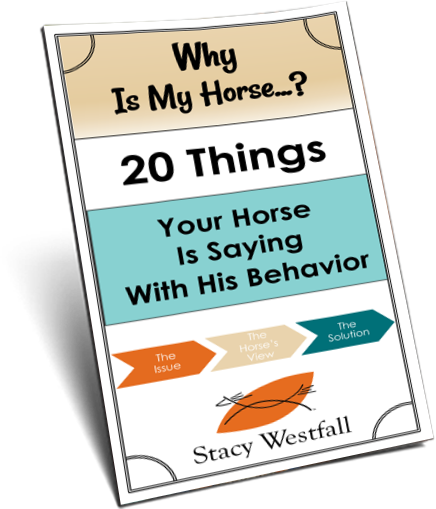 If your horse is nervous, agitated or shows others signs of being unsure I would recommend staying in this step. I forgot to video tape it but I kept riding out to replace the balloons. Often at club meets you can bring your horse and simply set balloons. This way your horse is exposed to the environment without a lot of pressure. I like to practice dry runs and dry-firing. This is a great way to prove that you have control of your horse while riding one handed. You will also find that it takes coordination to handle the gun and the horse. It is important to be smooth with both and dry practicing is great. It also saves money because you don’t need ammo and balloons. If you have an interest in the sport but don’t have guns yet you could even do this step with a child’s cap gun. I showed this step in my last video but this time it is slightly modified. I am closer to the experienced horse and Newt is able to see more of the smoke and what I like to call the ‘disappearing balloon act’ which is surprising. Remember that in the first video the shooting has only been done behind Newt’s saddle so this is the first time it is in front and more visible. You can see he is a bit surprised at first. In this step the seasoned horse is still riding along beside us but we have changed places.It should be noted that we are using blanks, there is no projectile. The black powder is enough to pop a balloon but also burns out after a short distance which is why this is a safe spectator sport. I am also using ‘light loads’ which means that there is less powder than what would be used in competition. This also means that it makes less noise, less smoke and has less reach. I like using the light loads for awhile with my horses. Training the rider is a big part of this process. You can hear me correct myself by saying, “Don’t look down!” because when I went to switch my guns I looked at my holster. At this speed and during training this isn’t a big deal…but I need to train myself for when I will be running fast. Mounted Shooting has been a great hobby for me and it has been a fun training tool. 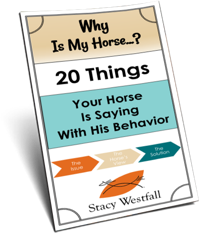 If I see one common mistake with new shooters it is not taking enough time when training their horses. The horses MUST be easy to control, one handed, at the speed you want to run the pattern WITHOUT shooting. If you can’t run the pattern smooth while dry-firing there is no reason to think it will get better when you add ammo. I did take my own advice and I have ridden with other pros including both my club, The Northern Ohio Outlaws, and other pros. Thanks to Outlaw Annie aka Annie Bianco-Ellett for her time and coaching during this video. Awesome, I have a bow and someday will shoot from horseback. I’ve been interested in this shooting for a long time. Hope I get to try it sometime. Newt did great! And you did pretty well yourself. LOL!!! He is such a beautiful horse I love just watching the way he moves. He looked really interested by the second shot when you guys were following the trainer shooting the first time. It looked like all of a sudden he realized exactly what you wanted and it was going to be fun for him too. He is a diva for the camera and crowd, you have to admit. And smart as a whip to boot! Love watching you and Newt ride.